Circa the Prince, located just around the corner of the Prince of Wales hotel, was different to what I imagined I didn’t realize that it was a spa retreat centre with rooms. It had a very discreet opening, with the entrance having dark tinted automatic doors. I have walked past it a couple of times, but have never ventured in. After walking in I realized it was quite hoity toity so to speak. Very posh. Though I have to say, if your after a quick breakfast, this isn’t the spot. I guess it is a retreat after all. 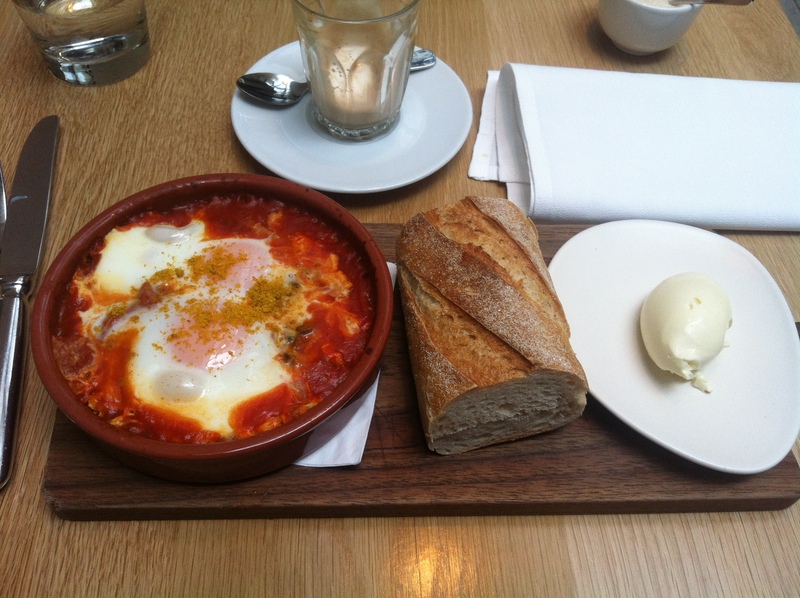 I ordered the Chermoula – Eggs baked in braised Moroccan tomato and kale served with Dukkah crème fraiche and baguette $18.00 (plagiarism straight off the menu). I asked the waiter, about kale, and he told me that kale is a type of cabbage. I was looking forward to this, as it would be a good marker against the Cumulus Inc breakfast which I enjoyed so much. The aroma though noticeable was rather standard. I guess they are not renowned for their coffee. A taste confirmed my suspicions. A little acidic, vibrant on the tongue with a discernible aftertaste. It lingered on the back of the throat. Not in a bad way. A picture tells a thousand words. And boy did this look good. it smelled wonderful as well. Again, the eggs, similar to Cumulus Inc, were cooked just right, with the right consistency, and texture. The baguette was warm, and the creme fraiche looked very inviting. Well, this topped Cumulus, but not by much. Very similar dish, but the addition of the zucchini and mint creme fraiche and the baguette got this over the line. It added the extra bit. The spinach was a good addition as well, the did not tip the scales. All the characters, Baguette, Eggs, and Creme fraiche worked really well together. This is how I devoured it. Lovely. I tasted the eggs and the creme fraiche on their own, and thy were nice, but the combo did it. Fantastic. Well, I only paid $20.00 on total, so not bad value for money. 7.5. It really did tip Cumulus Inc. It was great. « Sensory lab, little Collins st, Panama Don Pachi-Geisha.